Well, it appears that the Gente Gods are smiling down on me. First, Carole's positive news about my cousin in San Mango d'Aquino and this. In the mail today, from the comune of Feroleto Antico I received my grandmother Fannie's (Fenicia Mancuso) Atti Di Nascita and her parents' Antonio Mancuso and Rosilia Mascaro's Atti di Matrimonio. Since I've never worked with these types of documents before, I'd appreciate anyone's help in translating these or at least extracting the most important information. Trouble with Imageshack. Will post link later. Wow!!!! Biff that is great! Finally, some luck for you. Perhaps the impending birth of your new grandbaby is changing your luck? My eyes are bad and that image is a little small for me but I will do my best. 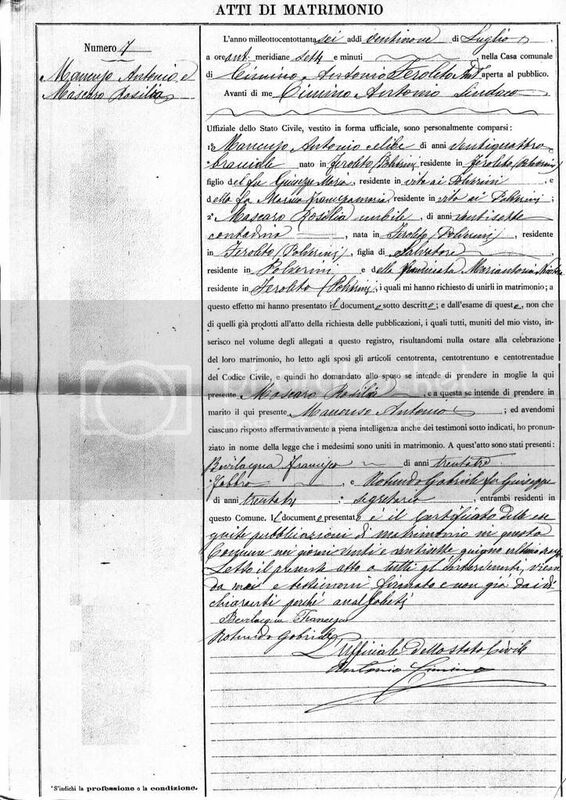 The year 1895, the 16th of (can't read the month but I think it may be January) presented to me (can't read the man's name) something, appointed by the mayor, official of the state civil records of Feroleto Antico, Father's name: Antonio Mancusco, son of the late Giuseppe, age 33, contadina(profession - farmer), domicile in Feroleto Antico (nella casa posta is where the address, section or hamlet is - I cannot read it but it starts with Palv - a bigger image would help) next is the mother's information it states that she is the legitimate wife of her husband and her name looks like Rosalia Moscaro ? daughter of Salvatore (who is still alive here) profession is contadina (farmer) and her age is 36. Below that is the name of the baby which you already know. The writing under that is beyond my knowledge - perhaps Carole can help with that. Sorry I can't do better - the image is too small for me (I need new glasses), but the important information I got. I am not sure about her mother's last name but it really looks like Moscaro to me. I cannot read the witnesses names or ages at all. Sorry. If you want you can email me a bigger image - I think if it was bigger I could read it. Oh and one more thing I forgot to mention. It has been my experience in transcribing my grandfather's town records that the witnesses are almost always related somehow. I've sent to you via email as attachments. In doing some research, I was able to determine that the hamlet in Feroleto Antico is Polverini. Hope this is better Biff..
And here is another site I found very helpfulful for translating the different acts.. Thanks Biff. The emailed copies were MUCH better! I would appreciate any help. Here is what I can make out of this marriage act. 1886, the 29th day of July in Feroleto Antico in the town hall the mayor Antonio Cimino had the following reported to him basically. 2. Mascaro (very clear here), nubile (meaning never married before), age 27, farmer, born in Feroleto/Polverini lives in Feroleto/Polverini, daughter of Salvatore (still alive) who resides in Polverini and (I cannot make out what it says before her name because it appears to be written over but fu wouuld go here short for a longer word meaning deceased) Maria Antonia Nicotera. The rest I do not know the exact translation for. I hope someone else can translate the actual document. The witnesses appear to be the 33 year old Francesco Berlacqua (? ), a blacksmith and Gabriele Rotundo, age 33, son of the late Giuseppe and a secratary. I hope someone else can translate the rest. Thanks Nuccia and Cathy. I can't tell you how excited I am. I've emailed another big thank you to Francesca Mascaro, the Anagrafe official in Feroleto Antico, who has so kindly and promptly responded to my requests for information. I'm also going to send her a letter giving her details of the family history with a couple of photos and a copy of the book Italians in Northeastern Pennsylvania as a gift for her kindness. The LDS microfilm records for Feroleto Antico contain info up to 1860. 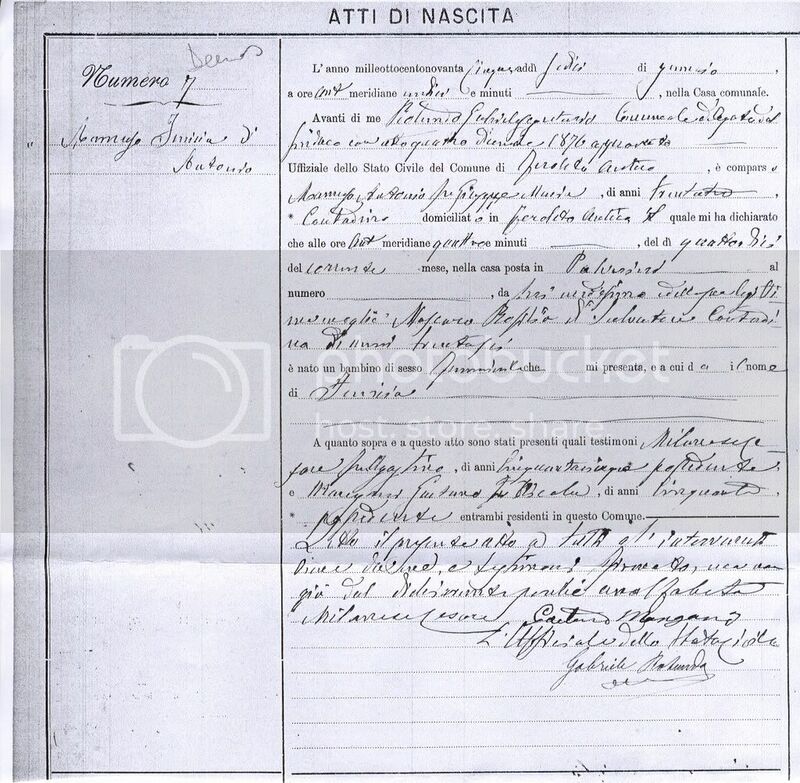 Having the names of Rosilia and Antonio's parents should be helpful in tracing the Mancuso/Mascaro/Maruca/Nicotera families back to about 1800. I've also been in email contact with Franco Falvo of Feroleto Antico who has authored a couple of historical works on the village. I've given him the information I have on my great grandparents and he has said he'll try to check and see what if any relatives might be still living in Feroleto. He's also revising the two books he wrote and will be reissuing them in a single volume next summer, and will be sending me a copy as a gift. Pretty neat. Hopefully cousin Angelo's letter from San Mango will contain the documents/information I need to jump start my search for the Epifanos. Biff, that's so wonderful!! I am so excited for you. You had better brush up on your Italian for that book! Can someone else make this out? Interesting that the L'Ufficiale dello Stato Civile on Fenicia's Atti di Nascita is Gabriele Rotunda/o. Possibly the same person who witnessed Fenicia's parents' Atti di Matrimonio?? Could the witness on Fenicia's birth act be Gaetano Mangano? I believe the witness on Antonio and Rosilia's Atti di Matrimonio was Francesco Bevilacqua. Simy and Carole should be online soon..Simy should be able to make some of this out. If Riccardo comes around he'll be able to help as well but hes trying so hard to stay away from the forums and just relax. Don't worry..we'll get this translated for you correctly. This particular form of handwriting is a nightmare. I believe that even many Italians may have trouble with it too. I certainly can't understand or decipher more than one or two words when this form of longhand is used....Sorry. Thanks for trying. Given enough time, I'm usually pretty good at deciphering some fairly atrocious handwriting, and I'll take a serious shot at doing just that over the weekend. I'll post what I come up with later. On the birth act: Gaetano is definitley one of the witnesses but the rest I cannot make out. This man gets an F for penmanship in my book. On the other hand the penmanship on the marriage act is beautiful! Carole can you make out something on that? Or perhaps Jim can? He has read thousands of these. I agree with Carole, it's a nightmare. I also cannot understand the handwriting. Sorry. Great idea about giving the official a little token of your appreciation!